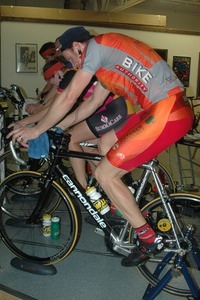 Excel In Cycling is an indoor program I've personally developed over the past 13 years. With a firm foundation in sports-science based training (neuromuscular, cardiovascular & strength/power), the EIC program is a three-month series of classes that gradually channel cyclists through increasingly more complex exercises, drills and intensity levels as the outdoor season approaches. You will absolutely build up your skill level as well as your fitness level as the weeks go by. Because EIC classes are set up to accommodate six different ability levels you have the opportunity to train with your peers - road cyclists, duathletes and triathletes, mt bikers and recreational riders - no matter what your skill set. You will be riding your own bicycle on a stationary trainer in a very motivating environment where music is played through a professional sound system, and where DVD cycling videos are projected onto a screen. 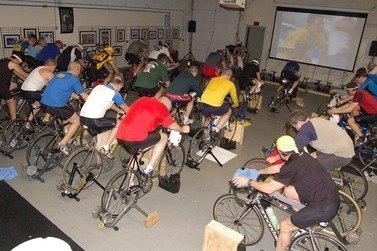 I will caution you though: EIC workouts are not "feel good, trendy" sessions in spin and Computrainer studios where many of the instructors have no concept of the art of true road cycling. EIC workouts are physically as well as mentally challenging. But if you want to ride as well as a smooth, technically proficient road cyclist then you must train like one! And at EIC workouts your learning curve is accentuated by my 30+ years as a competitive cyclist and mult-sport athlete, and my 20 years as a coach. The Excel In Cycling workouts are intended for people who want to become SMART cyclists, whether recreational or competitive. In each workout I will talk extensively about: training in specific heart rate zones and how to compare these zones with RPE - the rating of perceived exertion; form, cadence, technique and efficiency. Also Included with the workout is cold water and gatorade. Please bring your own towels and some sort of carbo supplement like jells or bars. And for those of you who are new to my workouts and/or are new to cycling in general, no worries because I structure the workouts such that you will be able to participate in the regular 2-hour routine by doing shorter drill and main set volume. You can participate with the "big boys and girls", at YOUR comfort and experience level and still learn some great technique at the same time. First workout for the 018’-019' season is on Saturday, December 1. Wednesday classes will start promptly at 6 PM and end promptly at 8 PM. Saturday classes will start promptly at 8:00 AM and end promptly at 10:00 AM. This season the classes will run from December 1nd through February 27, with 26 total classes. Cost of a single Wed/Sat workout is $10.00, cash or check only. For a family of three a single workout is $24.00. Current clients who I currently coach receive a discount on single and multi-day passes. Windtrainers are available to rent for $5.00/workout (please reserve 24 hours ahead of time). Punch passes can be purchased for any combination of Wednesday and Saturdays. Multi-day Pass package is $100.00 for 12 workouts. 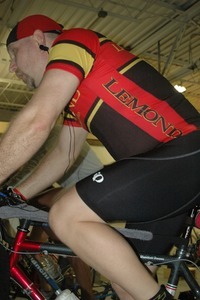 This year's indoor cycling workouts will again take place in Hudson at the LifeCenter Plus fitness center at 5133 Darrow Rd. This year both Wednesday and Saturday workouts will be held in the back of the facility in the conference area. To get to the Wednesday/Saturday workout venue in LifeCenter, drive to the absolute back of the building where you'll see a basketball hoop. There IS a separate entrance/exit drive for the back of the building. It's on Norton Rd, the first street past the gas station. This is the parking area for the rear half of the building, and there are a set of main doors where you can enter. You will also have access to a locker area here to. Why Is So Much Importance Placed On Pedal Mechanics And Cadence?